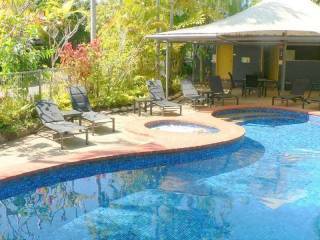 Serenity Accommodation Port Douglas is a newly renovated immaculate holiday home situated on much sought after Garrick Street, just 20 metres from the world renowned four mile beach and located just a few minutes walk from all the popular cafes, bars and boutique shops of the Port Douglas strip. 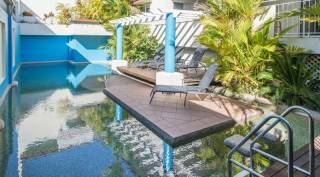 This Villa boasts a temperature controlled private pool, private tropical outdoor dining area and direct access to the beach and all with a brand new renovation. 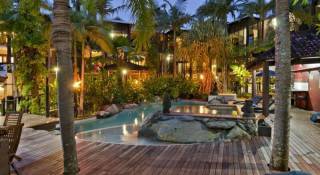 This 3 bed 3 bath house is amongst Port Douglas finest. 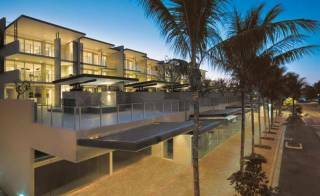 - Our prices are based on an occupancy of 2 Guests. Each ADDITIONAL guest attracts a charge of $50 PER NIGHT and each CHILD (under 3) stays free. The main bedroom has a queen bed and is situated on a mezzanine deck above the ground floor. It has garden views from its balcony and has ensuite facilities. The Second bedroom has two king singles that can be pushed together to make a giant king bed and has a separate bathroom. The third bedroom has a queen bed and an en suite. All bedrooms have air conditioning and built in robes. Two rollaway beds and a portacot are available.